Order as many Game Night Kits as you want for any events, anytime, anywhere! You don’t have to go through a retailer or prove to us that you’re running an event; you may use these as you see fit. All we ask is that you share the experience over a few games and do not purchase them with the sole intent of reselling them later. Also included is an insert with fun ideas and advice on how to best utilize your prize kit(s). These ship for free worldwide. NISEI is not-for-profit; the sales of these kits help us cover not only their cost but also artwork, shipping, web hosting, and more. The base price for the Q1 2019 Game Night Kit is $30 US; if you wish to donate to our organization, you may pay more at your discretion. Q: Does the GNK price include international postage and VAT? Q: Will there be any import duties to pay on a shipment to my country? A: Very likely not, but possible in some places outside the EU, Australia, and United States. Q: Until when can I order the Q1 2019 GNK from NISEI? A: The order form will be closed on 6th January 2019. 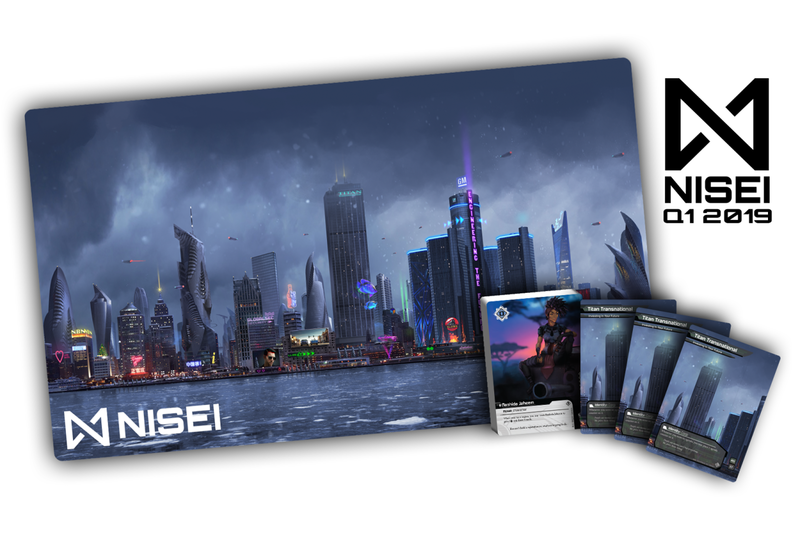 Q: Will I be able to order these cards or playmat after the 6th January 2019 through some sort of a “Print on Demand” service? A: At the moment we are not considering offering any “Print on Demand” solution after the 6th January 2019 deadline. Q: Will the playmat or card designs ever be reused for official prize support items? A: We want playmats and cards to be as unique for each season/event as possible. That said, we may consider reusing their art for another run in the future, or prize support in another format (for example, alternative art cards using playmat art, click counters using card art, custom sleeves). Q: Is there a list of events and places using the kit so we don't schedule ours at the same time as an existing event? A: We suggest https://alwaysberunning.net/ for scheduling events, but if you want to be 100% sure - please check in with your local meta. Asking on Stimhack forums, StimSlack, or anywhere else where “your people” gather is highly encouraged. This functionality will be available on NISEI's website in the future. Q: Can I use the prizes from the GNK for an event of any format or just for a “regular” tournament with Swiss rounds, etc.? A: The GNK is meant as basic prize support for any Netrunner-related event you want to organize. Yes, that includes fun trivia quizzes and “jank” tournaments!